Rick Ross is a successful rapper and entrepreneur who was the first artist signed to P. Diddy's Ciroc Entertainment. He founded his own music label Maybach Music Group in 2009. A few days ago he dropped his latest music video for the song "Santorini Greece", depicting his lavish lifestyle while on the Greek island. 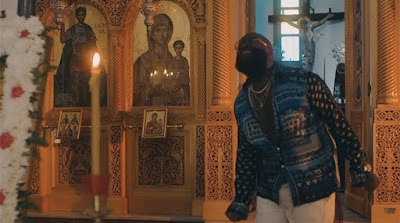 In the song he gets political and reflects on today's racial climate, which brings him to a church on the island, saying, "These niggas don't believe in God, from this very moment, you should believe in God." "With sadness today we were made aware of the use of the interior of the Church of Saint Eustratios in the village of Vourvoulos on the island of Thira [Santorini] as a 'stage' for the filming of a music video. This disgraceful event happened without any knowledge and permission of the Holy Metropolis of Thira, Amorgos & Islands. On the same day a disciplinary procedure was ordered to verify the circumstances of the incident and to give responsibility for the desecration of the sacred site, and judicial protection would be sought against every person in charge. Today, which is also a day of honor and commemoration of the Exaltation of our Lord's Cross, we cannot fail to comment on the recent misrepresentation of the photographs of the Holy Church of Thira with the removal of the Holy Cross by LIDL and MEVGAL. Because the Holy Metropolis is not a devotee of the theory of the 'multicultural' character of the monuments, we make it clear that misrepresentation in the photographic imprint of a holy church cannot be tolerated for political or commercial reasons. On the contrary, it reveals a lack of respect for the integrity and sanctity of the monuments and, unfortunately, a lack of education. If, as Greeks, we accept lightly such arguments of 'political correctness' or 'multiculturalism' to distort the respect of our faith and our civilization within Greece, let us bear in mind that similar excuses are also used by states of other religions to justify the desecration of Christian churches."